Not since my last backpacking trip one year ago have I had the pleasure to hoist a 50lb pack on my hips and shoulders and go for a 'leisurely stroll' down a dusty path. 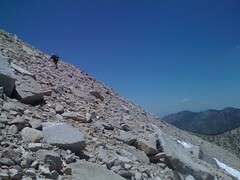 Approximately 30 miles in total, two nights under the stars and 4,000 of vertical feet from the parking lot. We managed to blaze our own trail on the second day of our hike by missing the [air-quotes] "trail" and finding our own way up the face of the rocky peak. During endless switchback hikes, I've always wondered what it would be like to just head straight up ... I no longer need to ask myself that question. Answer: It's slow-going, a little painful and scary at times. Rocks slid under foot and hearts were pumping through shirts. All in all, I think the altitude played a part in our decision to forge ahead up that beast. In the end, we were rewarded with a beautiful view, a wedding at the summit and a [once again, air quotes] "easy trip" down the switchbacks.